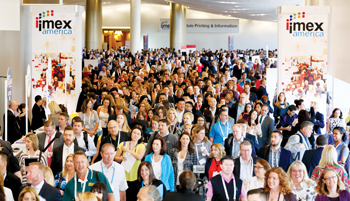 The sixth Imex America sets new records all around the show, reported Imex Group chairman Ray Bloom as this year’s event drew to a close last month in Las Vegas. There was a record number of exhibiting companies – 3,250, a 4.8 per cent increase on last year – representing 139 countries. They included 69 new booths and another 69 booths had expanded year on year. Together they created the largest ever Imex America. Well over 3,000 hosted buyers attended the show this year, also a new record. An important new pinnacle was reached in the number of appointments. More than 60,000 individual appointments and booth presentations were made, while there were 10,000 attendances by buyers at group appointments. This represented a 5 per cent increase in appointments over last year’s show. This year, Imex America introduced a new feature to its appointment scheduling system – appointment types. When making an appointment buyers were asked to specify the reason for the meeting; as well as being invited to attach a profile or mini-RFP to their appointment. The result was that the proportion of appointments with RFPs attached increased significantly from 51 per cent of appointments in 2015 to 69 per cent this year. The Exhibition and Meetings Safety and Security Initiative (EMSSI) was launched at the show, attended by Bruce Davidson, director of the US Office of Safety Act Implementation. A series of event tech, innovation and sustainability tours were among the many new initiatives in the show floor education program which this year offered a record 269 sessions. About 86 per cent of these sessions were assigned with CEs for CMP certification, more than ever before. A new Senior Planner Open Forum was successfully introduced for those with 10 years plus experience and the daily MPI keynotes attracted great interest and gathered strong positive feedback. More than 40 leading buyers from the corporate sector who control annual meetings budgets in excess of $3.4billion attended the annual Executive Meetings Forum.